The Makeup Show NYC took place in early May, drawing together makeup artists and their favorite pro brands for two days of kit stocking, education and inspiration. Kett Cosmetics occupied prime real estate at the show anchoring a triple booth with Muse Beauty Pro. The newest additions to the line, Kett Fixx Powder Foundations and the adorable Mini Jett, drew much attention and the large space allowed artists to snap up many of their favorite brands in one location. The well stocked booth also provided Sheila McKenna with full access to her top picks all of which were put to great use during her boothside makeup demos. For Sunday’s demo, Sheila perfected Lily’s skin by airbrushing Kett Hydro Foundation in R1 and Hydro Contour in Sunkissed as a bronzer. She used the Viseart Warm Matte eyeshadow palette to create a striking sunset look and tapped a dab of Lucas Papaw over the lid for a glaze finish. The result was simply sublime. On Monday, Sheila designed an edgier Rock inspired “Acoustic Noise” look for Lily. She began by blocking out Lily’s brows and then proceeded to airbrush Hydro Color Theory in White and Hydro Metal in Star Dust. The effect of static feedback was painted by hand using Hydro Color Theory in Black and finished off by applying a splatter of Hydro White down the center. In addition, Sheila spoke on the Beauty Branding panel along with Eric Kaiser of Glamcor and Madison Mallardi of Limelife by Alcone and moderated by Danessa Myricks. In this feature presentation event, each panel member shared their personal insight and answered questions about the many aspects of creating and maintaining a successful beauty brand. In overall wow factor, this year’s show was truly stand out! Keynote speakers included today’s top artists Roshar and Hung Vanngo, among others, as well as a Monday morning address by the legendary Bobbi Brown. There was so much to take in, see and learn. 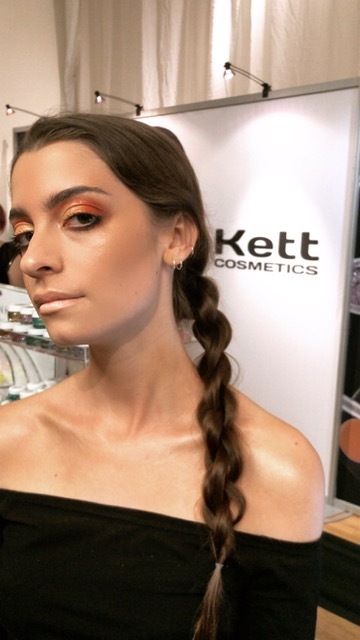 The Makeup Show NYC has outdone itself once again and Kett Cosmetics remains proud to be part of this amazing and inspiring community!